March 1, 2014 to ... Ended May 1, 2015. 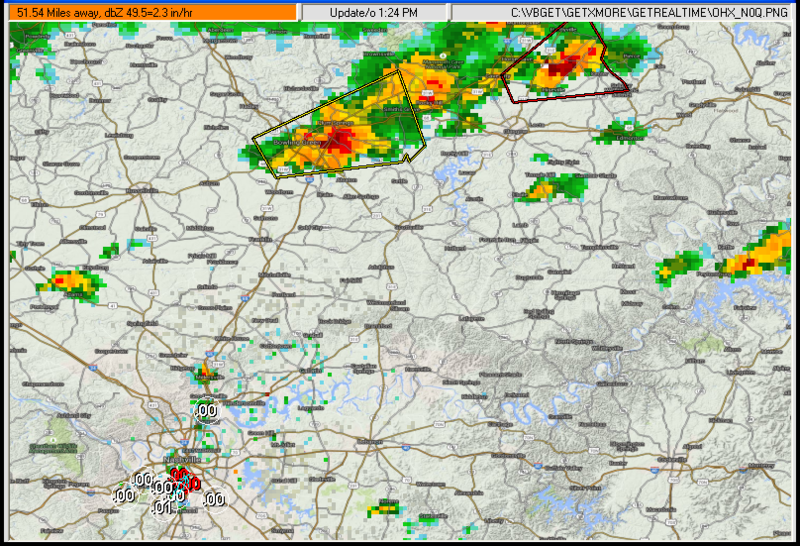 Current NOAA N0R radar lite gif above with Browns Creek Basin overlay. 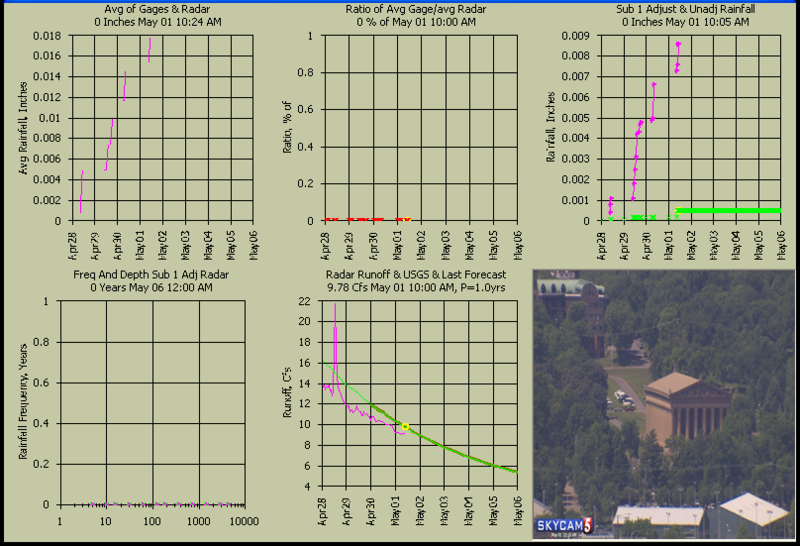 Below is zoomed N0Q radar, Wundergages, and adjusted N0Q at watersheds. Note that the raw N0Q radar here almost always shows "ground clutter" because of being so close to the radar site. 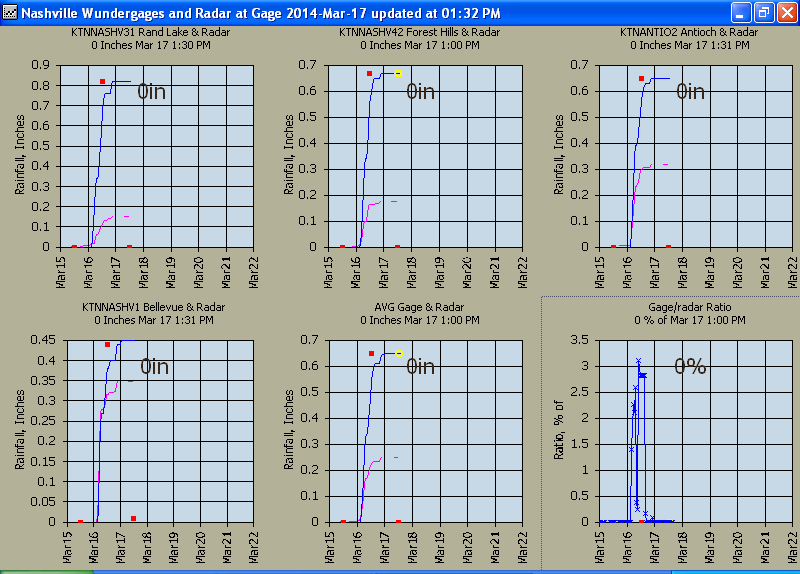 Ground clutter (0.05" to 0.1" a day) is just another simple matter that rain gage adjustment removes. No rain at the rain gages for the hour then no radar rain. This is a quick study to show that with a day or 2 of your time that you can setup a real-time multi-subbasin radar rainfall compuatation using GetRealtime. 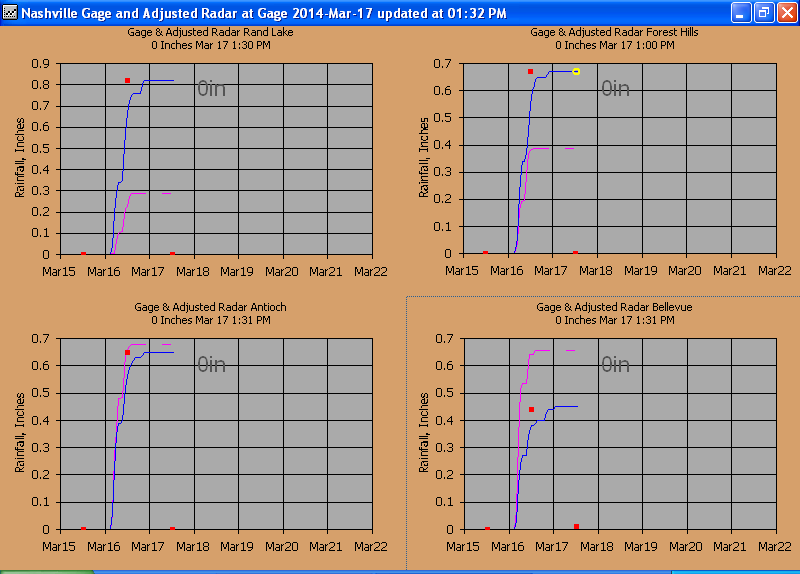 A small 11.8 sqmi basin in subburbon residential Nashville, TN was selected with a USGS gage. The initial lumped basin runoff coefficients were cookbooked and then evaluated with the USGS gage and revised as needed. The revisions needed were for very large recession flows presumedly for deep soils with a lot of night crawler and gopher activity or an imperivious layer at the gage. The CN loss was not adjusted but my normal large soil and groundwater losses had to be greatly reduced as well as speeding up soil drainage and weighting and extending my 3-triangular unit graphs recession and now all seems well. Probably due to the large average residential lot size and not reworking the soils too much during construction and never dismiss them worm holes and varmits. Next the basin was subdivided into 3 subbasins and the lag times and base flow were distributed with area size of the original lumped basin size. I had thought one sub in paticular would need much higher % impervious but has not been adjusted yet (update, it was 4/3/2014). (Note: If your lag times start to go below 0.5 hours you should switch your unit graph method to the 3 linear reservoir method which should give the same resultes around 0.5 hours but you'll be glad you did. GetRealtime makes this an easy selection.) Pretty simple, so let's see what I did and then how we do. 11.8 sqmi so says the USGS, we shall see.... bingo on the dot! 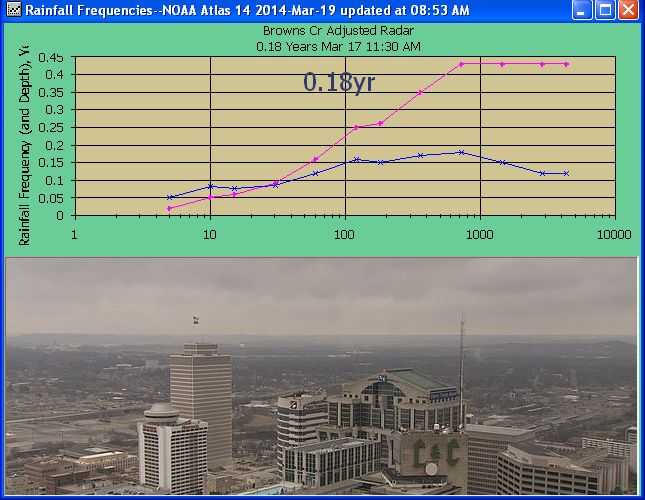 Now we need to convert our lat/long boundary to radar pixels for radar OHX Nashville. 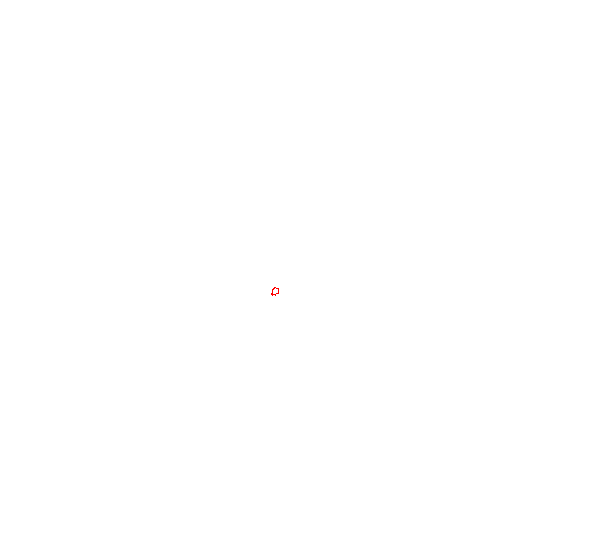 You use LatLongPixelsFromFile.exe to convert your GetMapArea boundary text file to pixles, copy to your GetRealtime radar image folder and create the point file for it using GetNexrad.exe. 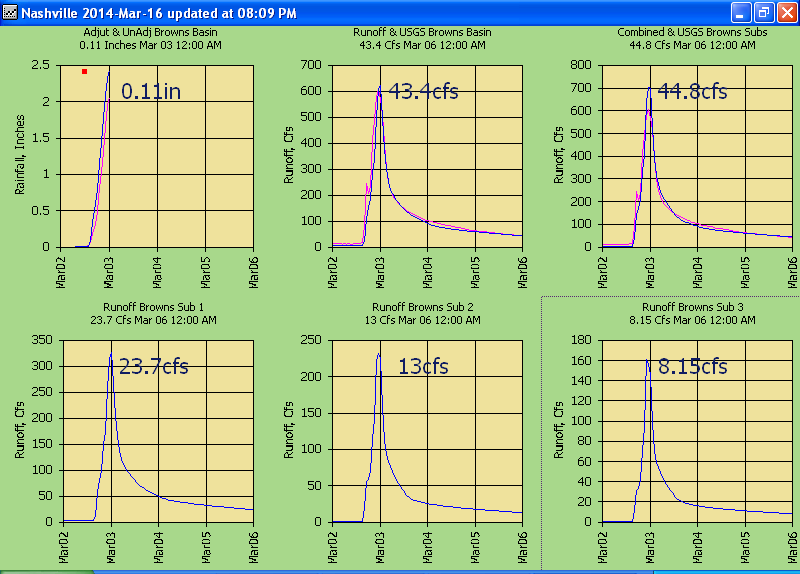 I also digitize the stream lines for radar display and do the same using DSID=1 but no point file is created. Use my free LatLongPixels.exe to create the Wundergage's boundary files and the point files. Interesting... did you note how the peaks of the 1960's-70's seem to be from a different population of mean and variance than the post 1990's. Global Warming! I mean Global Cooling! Or maybe they built more houses to keep warm? Which caused the warming, I mean cooling. What ever pays the most I'm always for. And seeing the 2010 outlier I decided to do this historical event as shown at the bottom. NOTE: The violet colored series is always the 2nd series referred to. 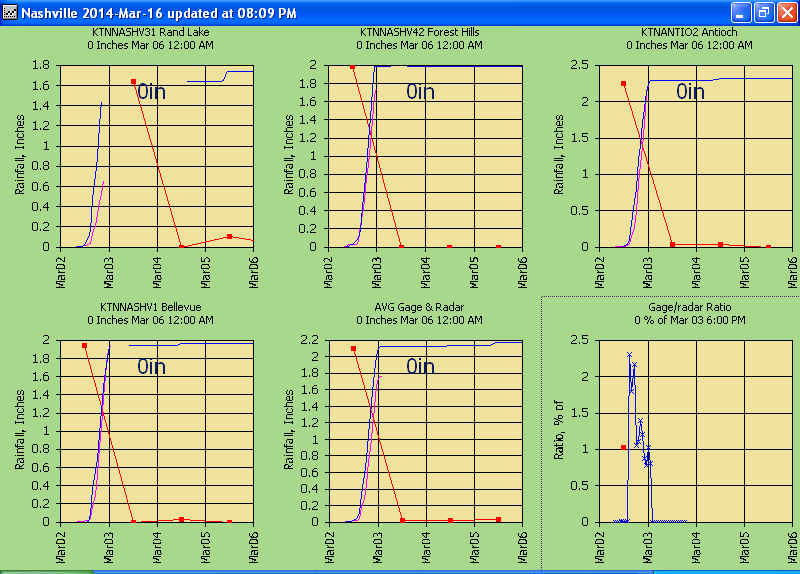 As a quick example the graphs shown are the real-time graphs of my GetGraphs.exe and what a user sees in real-time. The radar at the gages displayed hourly... base flow raised from 4 to 8 cfs but reset to 2 after thinking that the soils just need some initialization and other factors will be changed soon enough. Month 2: Northeast Sub 2 with industrial and commercial area percent impervious raised from 20% to 50% and directrly connected raised from 0.4 to 0.8. This did not change the historic 5/2/2010 peak but doubled the small 4/3/2014 peak here. Month 3: From the Month 2 peaks it looks like I raised the % impervious a wee too much. I will adjust when a new peak comes in for May. Below is the current coefficients for the large Sub 1 which is almost the same as the the other two. I increased the recover rate to steepen the recession and shifted the increased soil flow to the more rapid groundwater flows. 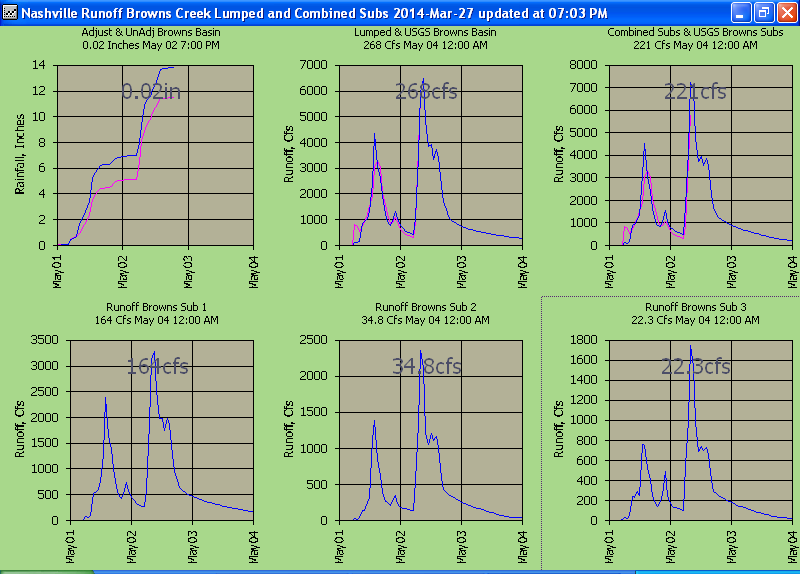 Base flow increased to 4 cfs and soil losses increased a bit. Month 5: Recovery factor lowered from 0.4 to 0.25 to lower recession, base triange lowered, dry CN raised, and groundwater recovery factor adjusted. Hey, it's getting there. REAL 5-MINUTE HISTORICAL EVENT May 1-2, 2010... WOW!!! I used the NWS Weather Toolkit to download the May 1-3, 2010 N0Q radar which is never fun but somebody has to do it (Iowa Mesonet missed these). The Wundergages all crapped out so I used the nearby (2.5 miles east) KBNA airport Wundergage to adjust the radar as a last resort. The USGS flow gage also crapped out so only their peak of 8,540 cfs on May 2, 2010 is available. I had to develop a flow rating to fill in what is shown below Q=15.95*(GH-0.43)^2.4491 from USGS gage heights and should be very good. The airport adjusted radar subdivided peak came in as 7,900 cfs so thats good. The radar showed cells continously above hail condaminated dbz >55 with a continuous maxima about 58-60 dbz and up to 64 dbz on the scope but over all the gage corrected hail capped radar z-r seems adequate for this storm. No reports of hail for this periord. I deleted the N0H target type so forget about downloading it twice, dang! I also tried using a daily Airport/Radar ratio instead of hourly but that really reduced both day's peak flows so no help there. I searched and found 5 reporting widely scattered Wundergages and only one had a 5-minute rainfall above the hail cap and was just barely above at 6.12 in/hr so with storm cells moving at 63 mph you get one shot so no loss of sleep there. Anyway what is eye-popping is the 2,250 year recurrance 2-day storm duration and this is for a 11.8 sqmi basin rainfall average (but lag time is 1 hour). No wunder the gage washed out. So when the next big one hits, you better have your radar trimmed and burning because the flow gages may not be there. I wonder what the forecast was??? See below. The first wave of the storm was a 169 year 12-hour event then followed the next day by a 148 year 6 hour event. 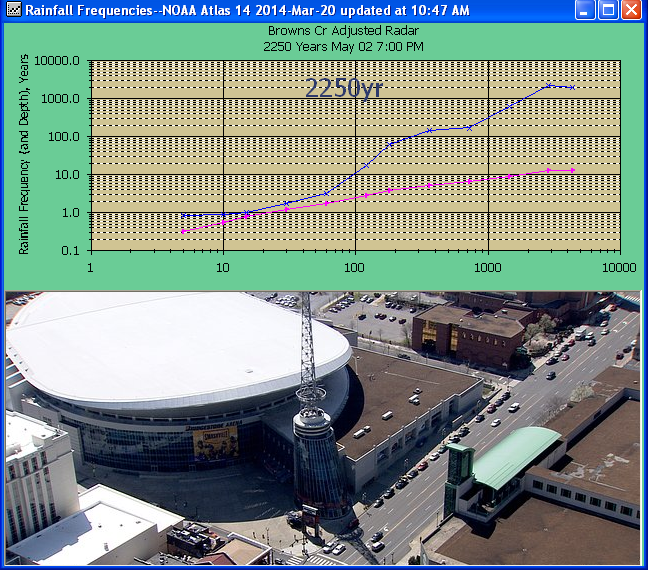 The odds of that occurring in Nashville apparently is 1 in 2,250 years from a linear rainfall vs log recurrance extrapolation beyond 1000 years in NOAA 14. As for the 8540 cfs USGS peak flow, based on just the log Pearson stats ignoring regional skew, the mixed population, and this peak, the 8540 cfs has a recurrance somewhere out there past the age of the earth. "The primary recommendation identifies the need for improved communication and collaboration between WFO Nashville, the OHRFC, USACE Nashville (LRN) and the Tennessee USGS." -- Beggar thy neighbor. Sounds like they all should have been using GetRealtime on Windows with their GetAccess database in DropBox for better communication! 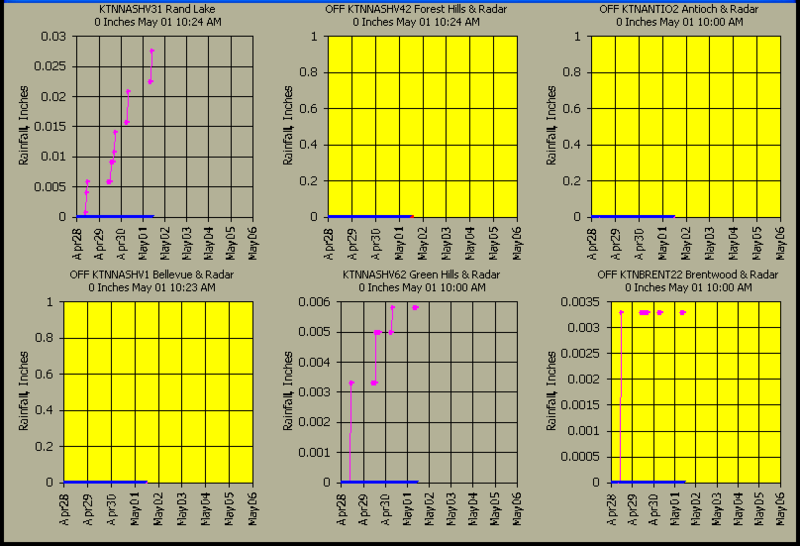 Download the Nashville N0Q Radar images for May 1-2, 2010, 58 mb and view with GetNexrad and create return frequencies for any point you click. If you would like to run the Nasville 3 day storm over your basin, download the OHX zip file, unzip, and rename or copy KOHX_*. * Kyyy_*. * where yyy is your radar id. In the now named HTX_N0Q_0.Kfw, change the lat/long values to somewhere to the northwest of your basin location. You can try different lat/longs to try and maximize rainfall over your basin. You could even use s Forecast Wizard to paste in just the values as a 44 hour forecast and save to all your subbasins. Tip: Paste the above in Excel and then copy the values column and paste in the Forecast Wizard. After using the values and the forecast wizard for several of my projects I found something interesting. 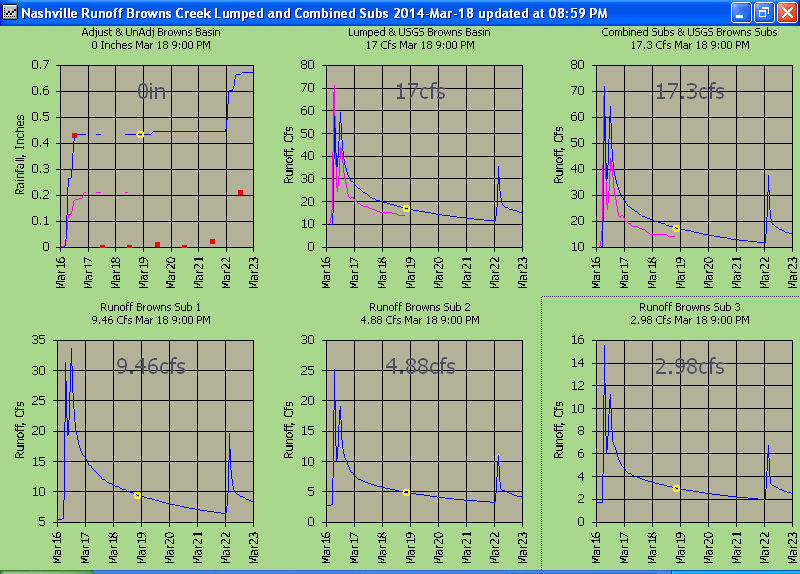 Depending on lag times/basin size the runoff can be very unremarkable. I don't know why the runoff frequency was so high on this small basin so give it a try on yours. In New York it's a 124,000 year storm, in central Alabama just a 283 year storm, the 1-hour was 2.3 years, the 6-hour was 39 years, but for this 3.7hr lag 34 sqmi basin the runoff frequency was 1,360 years so dont let a low frequency short duration storm fool you if it happens 2 days in a row. The same storm but transposed radar in northern Alabama had just a 20-year runoff frequency so who knows about yours.